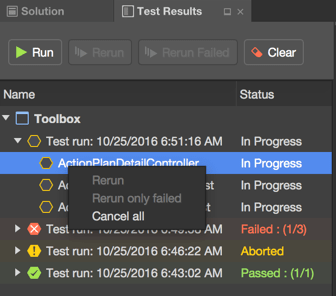 The Test Runner process is implemented in a separate panel, so you are able to continue developing while the tests are running — the test-runs status is updated automatically. the Main Menu: Project ⇒ Run tests. NB: Please note, if you changed a test and now you want to run it, you need to build it first. Until it isn't present on your org, it won't be available. You can cancel a running test job if it's unnecessary anymore. This option is available for the whole test-run. A test job should be still in progress. To cancel a test job select the Cancel all option from its context menu. When you use the Cancel option for the whole test-run, the classes that are in progress will be aborted and will have the appropriate status, and the classes that have been finished will have the timely status from Salesforce.